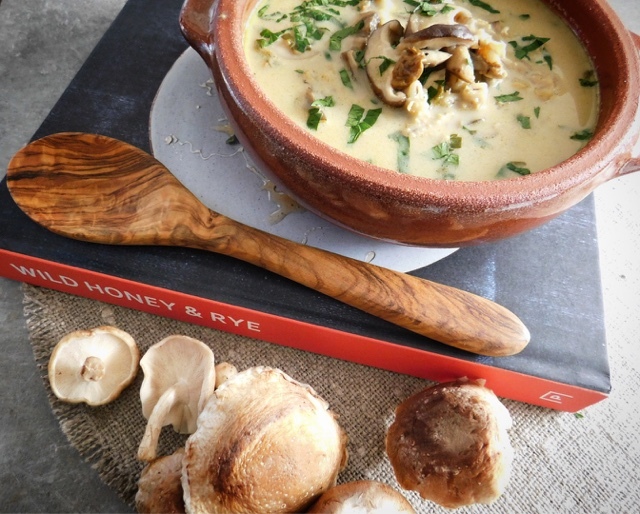 Forest Mushroom Soup from the debut cookbook 'Wild Honey and Rye' by Ren Behan. 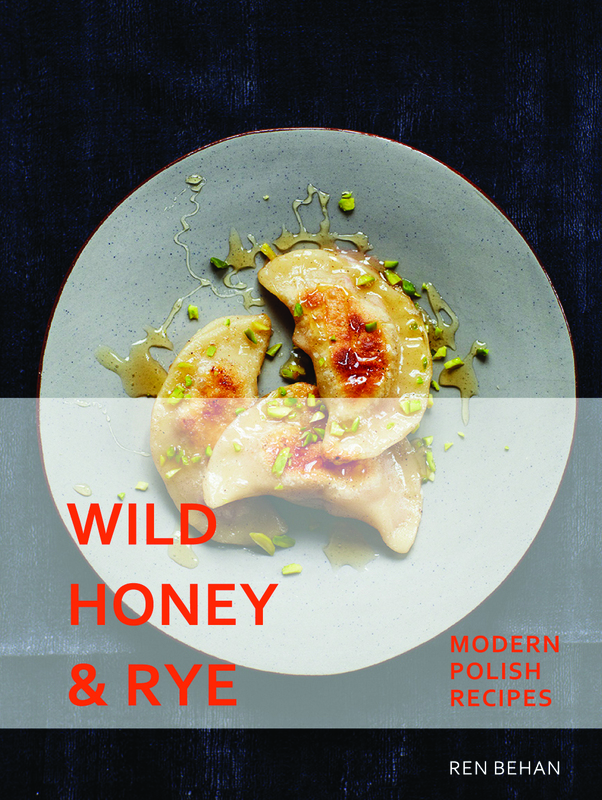 In this book we are invited to discover the very best of the new food of Poland with lighter healthier versions of traditional dishes and fresh seasonal fare served in contemporary ways. 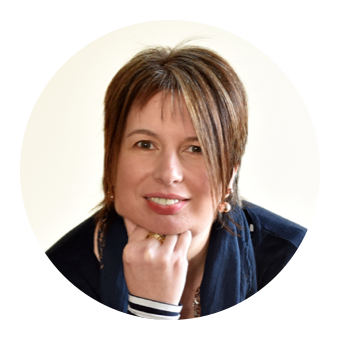 I'm delighted to be sharing a recipe today from yet another blogging colleague's newly published debut cookbook. Hot on the heels of Katherine Hackworthy's Veggie Desserts from which I shared a Strawberry & Spinich Swiss Roll, Ren Behan's book 'Wild Honey and Rye' hits bookshelves today. Ren is a British food writer of Polish descent who has blogged for the last six years at www.renbehan.com. Inspired by the food of her childhood and by the new wave of flavours to be found in the fashionable eateries and farmer’s markets of modern Poland she has compiled an evocative, mouth-watering collection of recipes, truly celebrating her heritage. 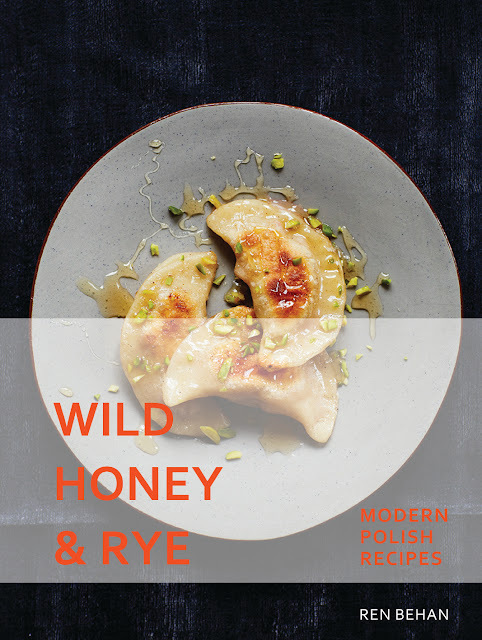 To find out how her first cookbook came into being read The Story of Wild Honey and Rye on her blog. The book itself is absolutely gorgeous to flick through, read and cook from with wonderful introductions and personal stories to accompany each chapter and recipe. It's divided into seven chapters which I've shared below along with a couple of my 'bookmarked to try' recipes from each. Hopefully this will give you a feel for the variety of it's contents. It kicks off with an Introduction and The Polish Pantry which provides advice on sourcing ingredients and what alternatives could be used. My own knowledge and experience of Polish food is very limited. I've looked curiously at the Polish grocery shelves in the supermarkets and have eaten Bigos (Hunter's Stew) and Pierogi (the classic sweet or savoury dumplings) in a sadly short lived Polish Restaurant in Aberdeen. But that's pretty much the extent of it. The reality of what Ren shares is far from what you may expect of cuisine in a post communist country. It's certainly not solely vodka, cabbage and rib sticking stews and dumplings. It seems that the contemporary Polish food scene is striving at both street food, home cooking and Michelin star level. In addition to inspiring me to recreate her recipes at home, I've also been inspired by Ren to add a visit to Poland to my ever increasing travel bucket list. 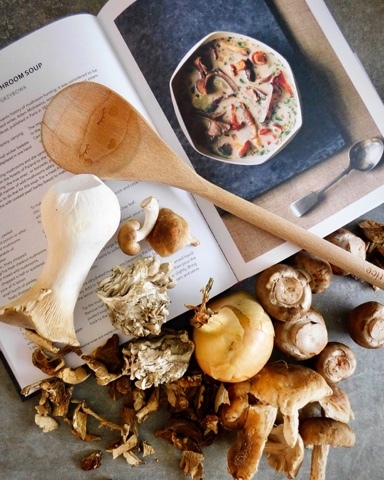 Many of the recipes that immediately caught my eye seemed to contain mushrooms and the first one I chose to recreate was Forest Mushroom Soup. Alas my mushrooms came from the supermarket rather than the forest so did not have quite as intense a flavour or colour as the original version. I also used a vegetable stock cube as -shock horror - I never make my own stock. I absolutely adore pearl barley so cooked up 200g of this for 45 minutes which I stirred through at the end. The resulting soup was earthy, rich and with the addition of the barley a meal in itself. I shall definitely make it again. Particularity should I be lucky enough to stumble across a patch of Chanterelles in the coming weeks. Ren says "My grandmother adored picking mushrooms and she carried the knowledge of identifying mushrooms with her throughout her life, from the forests of Poland to the forests of England and Wales, where she would look for prawdziwki, meaning ‘the true ones’, or borowiki, porcini mushrooms, as well as other edible fungi. 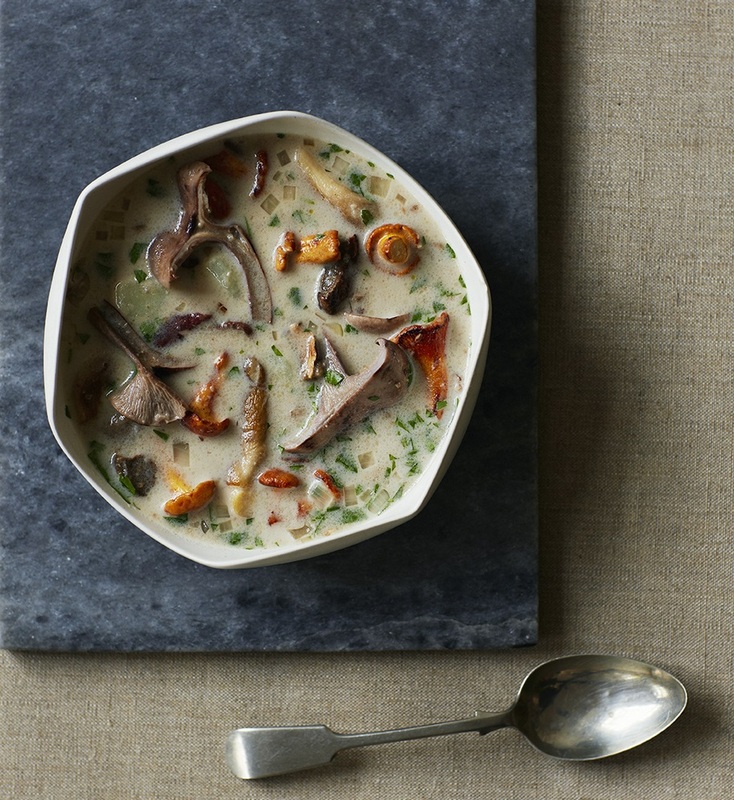 Of course, you can buy all manner of wild mushrooms safely from local food markets these days, so I would probably encourage you to do that for this soup. For a meat-free version, leave the chicken out of the stock. You can serve this with cooked pearl barley (kasza) to make the traditional Polish soup, krupnik." To make the stock, put the ingredients and a pinch of salt and pepper into a large pan. Cover with cold water (about 2 litres/3½ pints/2 quarts) and gently bring to the boil, using a spoon to skim off any foam that forms. Leave to simmer for 1½ hours. Chop the potato into small cubes, add to the stock and cook for a further 15 minutes until the potato is soft. Remove the chicken wings, onion, celery and bay leaf. Put the dried mushrooms into a cup or small bowl, pour over some boiling water and leave to soak. Heat the oil and butter in a large frying pan and gently fry the onion for 5 minutes, until it starts to soften. Add the fresh mushrooms and cook for 5 minutes. Drain the rehydrated mushrooms (reserving the liquid) and chop very finely. Add to the pan with the fresh mushrooms. Squeeze in a little of the lemon juice and stir in the chopped parsley. Tip the mushroom mixture into the stock and pour in the reserved liquid. Remove half of the soup and transfer it to a blender, blitz, then pour the puréed soup back into the pan. This will thicken the soup slightly. Bring back to the boil. Take the soup off the heat, stir in the cream and serve. 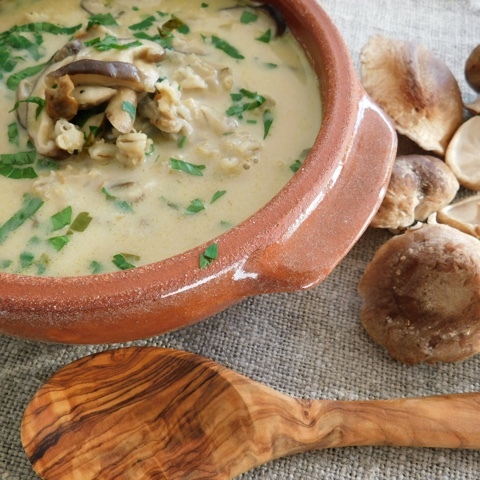 Oooh this mushroom soup looks absolutely gorgeous! Ren's book is stunning and I can't wait to cook more from it. That soup looks fabulous - just the thing for the time of year. Looking forward to cooking lots of lovely things from this book! That looks beautiful, just what we need on a cold day! Soup has got to be the ultimate comfort food. Apart from pierogies, my knowledge of Polish food is very limited as well, so I'll definitely have to check this cookbook out. I adore mushrooms, and in a creamy soup? I'm over the moon! Yup my knowledge is very limited but I shall be scouring the Polish food shelves in the supermarket with renewed interest. Such a beautiful recipe, it's on my list to make. Love this book and really pleasantly surprised by Polish cooking. Me too. I expected more 'stodge'. I need to cook this soup!! Looks delicious! I can't wait to make some more of Ren's recipes, this one is definitely on my list. Chanterelles are the only ones that I'm 100% confident at identifying. I'm really enjoying this book, and have also been drawn towards some of the mushroom recipes and also those featuring big flavoursome Polish sausages! Yes those Sausages look amazing! This looks wonderful, I actually almost made this, especially as I happened to find some beautiful mushrooms too! Lovely book! Tis the season for mushrooms! This looks delicious! I lived in Poland for a couple of years and the soups were amazing. Really hope I can visit sometime soon and try the food for myself. My friend is on holiday in Poland at the moment and her Photos and your book are making me thing a trip is required sooner rather than later. That looks beautiful Claire, and you've just reminded me how much I love, and how long it's been since I last indulged in a decent mushroom soup! This one has such a rich and earthy depth of flavour. I'm ignorant too but Ren's book is a great introduction. Fab review. That soup looks so good. I just want to go out and pick mushrooms now. Nothing is more comforting on a cold autumn evening than Polish mushroom soup :) This is probably one of the things I miss from my childhood... going in the forest for a mushroom hunt!